Whoever wins next week’s Pennsylvania governor’s race will have climate change on his agenda. That’s because states now have to implement new EPA rules decreasing carbon emissions at power plants. Gov. 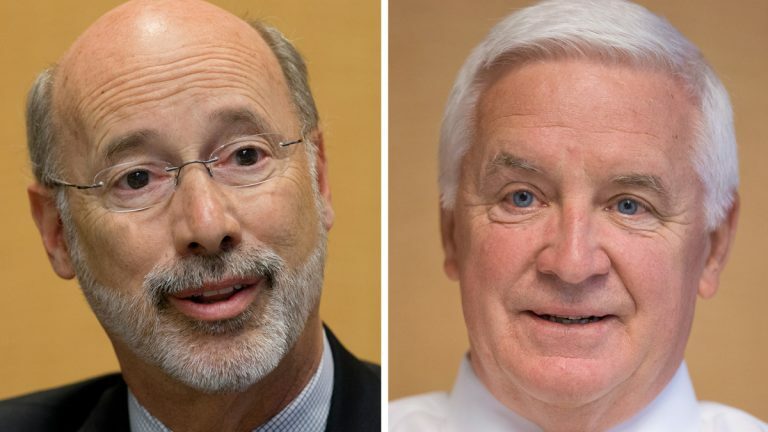 Tom Corbett and his challenger Tom Wolf remain far apart on how to reduce the state’s carbon footprint. The Environmental Protection Agency’s proposed rules would make Pennsylvania cut its carbon emissions by 32 percent. And for Pennsylvania, that means burning less coal. Corbett has criticized the EPA’s proposed rules. Corbett won’t say whether he would have the state join a lawsuit challenging those rules. But he does say the EPA has overstepped its authority by not having Congress review the proposal. And he recently signed a law that tipped its hat to the coal industry by slowing down the rules. Corbett’s Democratic opponent Tom Wolf is taking a pragmatic approach. Wolf says he can work with the coal industry to figure out how to produce electricity with a smaller carbon footprint. States have until June of 2016 to submit a plan to the EPA.